I've written about this before but I think it can always be a good reminder. When you are struggling and if you are trying to recover, or not recover you hear alot of advice and told that things will get better. You get told to do X or Y. People tell you that eating chocolate won't make you gain weight, that eating 3 course meal at a restaurant won't affect you negatively. That not exercising for a week or two won't affect your body negatively. .... and it's hard to believe. Or you think, that wont work on me. ... but the fact is.... you have to try it and see what happens. 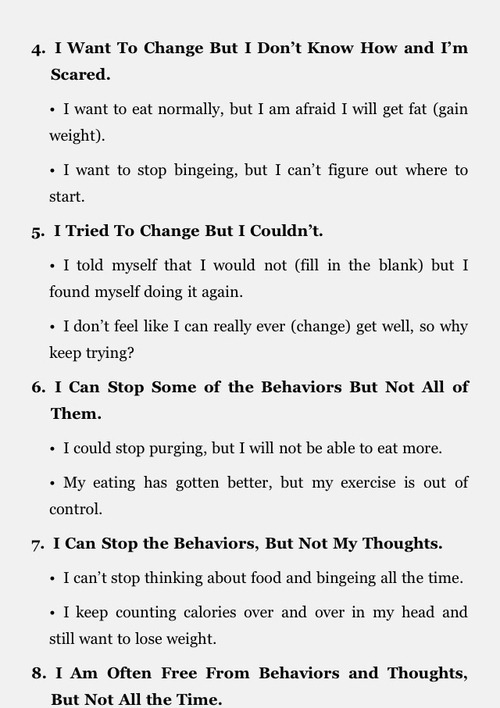 When you first begin to eat normally and regularly then your weight will go up quicker and you will be very bloated. That's part of recovery - for most people, apart from the exceptions who this doesn't happen to. So in the first weeks of recovery you just got to accept this, and know that the weight you gain in the beginning is alot of water weight. I know it can seem like you are an exception or that what people tell you isn't true or won't work on you. Or maybe it's too scary to try what people tell you. But you need to try. .. Because what is the worst thing that could happen? If things don't turn out the way you had hoped then you can always go back again. I was told during my recovery that I knew how it was to be underweight, but I had to give healthy and a healthy weight a chance before I said no. My case manager told me that if I didn't like my body or life when I was at a healthy weight well then I knew how to lose weight. But I couldn't say no until I tried. And it sounds stupid but it is true. ... but you have to atleast try. You have to try to reach your healthy weight and then wait. ... focus on self love and acceptance. and well. ... If you don't like the way you look then you know how to lose weight. But I wouldn't recommend that. You need to try things. Try going a whole week without exercise. Even if it's tough and scary and you don't know what will happen. Or try increasing your meal plan, eating the amount your body needs. ... Try it and see. But don't just try it once and think never again. It's like with fear foods, you need to keep trying them until they are no longer fear foods. Not just try them once and think, I've done that never again. 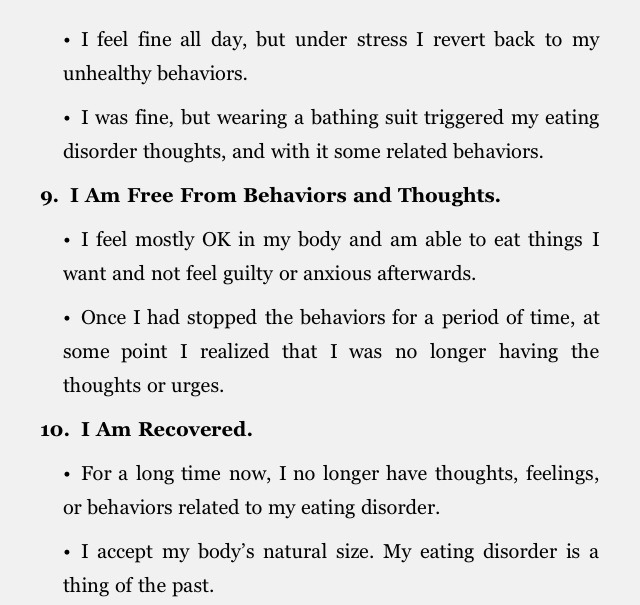 You can't let your ED or fears control you. Because unless you fight them they will always be there. Try and see.... its with all things. You can't get your drivings license without trying to drive a car. You can't get a maths answer right without trying it. You can't get better at running if you don't try it. You can't know whether you like a food or not if you don't try it. Try the advice you are given, however also be critical over the advice. Not all advice is good... but you do need to try. It's not enough for me to tell you that things will get better. But YOU have to try to make things better and realise that things get better. I feel like the phases are super accurate, but aren't always in that order. Like, I've always jumped around a lot. Totally depending on the day or period of time. Good post, though. 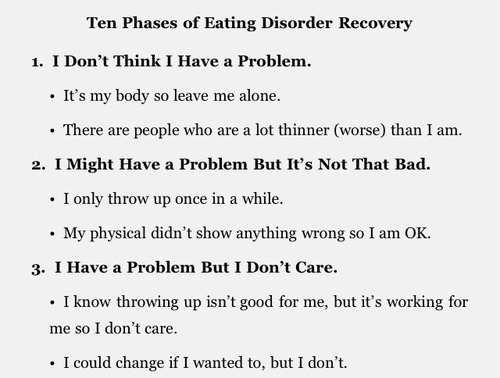 Really helps you realize what stage you're at and where you're trying to get in recovery.